Water becomes a precious commodity after a natural disaster or major power failure, or even a simple thing such as a technical problem with the water source. If those sources are contaminated, or there is no electricity to run a pump, where will people find water? The availability of water is usually taken for granted. Most authorities agree that approximately of 2-5 gallons of water is needed per person, per day (including cooking, drinking, hygiene etc.). Surprisingly, the need for water is much greater than the need for food. A person can survive without food for a week, but going without water after 3-4 days one can be faced with serious problems. Virtually every bodily function requires water and without it all organs are affected and death is emminent. Depending on the situation, water can be stored ahead of time. But storing water can be a problem. Not all containers are intended for food or potable water. Each person/family needs to have several back-up plans as possible water sources. 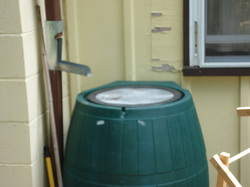 You can have rain barrels, but what if there is a drought that summer. You have a well with an electric pump-- obviously, the pump won't pump without power and ditto for the county/city water system. For people living in the city or in an apartment, you may want to look at a plastic bladder that would fit under the bed. Aquatank emergency water storage containers are one example of water containers that were specifically created to store a large volume of water in an easy-to-use food-grade container. Prior to use, the Aquatank container folds up and only takes up a small amount of space. If you live in the country and have a deep well with an electric pump, you may want to look into a solar pump set-up and/or dig a shallow well on another part of your land that could use a hand pump. If you depend on a gas powered generator for water pumping or anything else, you will eventually run out of gas. If all else fails, most of us live within a short drive or walk of sThe point of all this is to get you working on your water well before "the well runs dry", so to say. Are you looking to put a rain barrel next to your flower beds, or do you prefer to use as much rain water as you can in your garden? Maybe, you are tired of too much water around your house, foundation problems and water in your basement? Here is a perfect answer.The answer is the Aqua Saver. 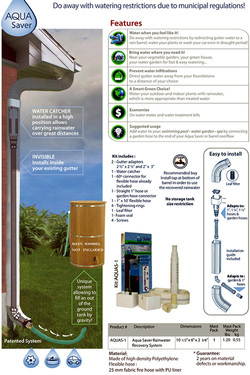 This kit allows you to divert most of your rain water coming down your down spout away from the house. provided special hose, cut to the length of your downspout and attach your own garden hose to the very bottom of the Aqua Saver kit. 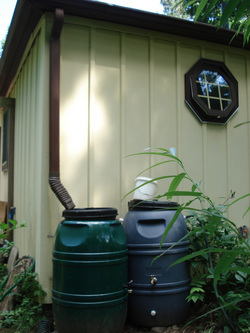 If you’re harvesting rainwater with rain barrels to use for watering your landscaping, the rainwater can help to improve the health of your gardens, lawns, and trees. Rain is a naturally soft water and devoid of minerals, chlorine, fluoride, and other chemicals. For this reason, plants respond very well to rainwater. After all, it’s what plants in the wild thrive on! 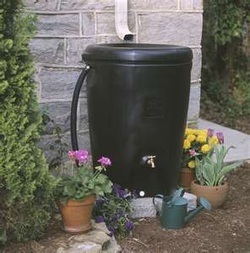 Collecting Water with Rain Barrels Harvesting systems can vary from the simple use of barrels aided by the force of gravity to deliver the water, to more advanced systems using cisterns, pumps, and flow controls. There are a few things you can do to find out what kind of rainwater harvesting system is right for you. The information presented in the rest of this website consists of a few simple steps to help you learn about rainwater collection before you buy a rain barrel or water harvesting system. There are many possible configurations and degrees of complexity to a rainwater catchment system. Costs vary considerably as well. You can spend anywhere from a few dollars to thousands of dollars. Your best bet is to review the options available on the market to find out what’s in your price range and what’s a realistic set-up for your home. .
How Much Water Can You Save During a Rainfall? To calculate the square feet of your house’s catchment area, measure the area of the outside walls and then include the overhang of any eaves. For example, let’s say you have an oblong house with outside dimensions of 36 feet by 46 feet. You’ve calculated the overhang of your eaves as 2 feet. So, add the 4 feet of the eaves to each wall length (2 eaves of 2 feet equals an additional 4 feet for each wall) to get the total length of the walls plus the eaves (40 by 50 feet). Since one inch of rainfall provides approximately 600 gallons of water for a 1,000 square foot catchment area, and our theoretical house has a 2,000 square foot catchment area (twice the area), you will multiply 600 gallons by 2. You should consider that rainwater harvesting systems aren’t necessarily 100% efficient. Most sources estimate efficiency between 70% and 90%. All rainwater harvesting systems lose some of the rainwater. It may spill out of the gutters or the wind may blow it away. Evaporation will undoubtedly affect some of it. To maximize your collection of rainwater, you can use out buildings such as barns or sheds. If you’re creative, you can even use rainwater from a patio or other paved areas around your house.